Around December 2014 or January 2015: Copies of Clinton’s emails are deleted from the computers of two of Clinton’s lawyers. On October 28, 2014, the State Department formally asked Clinton for copies of all her work-related emails, after asking informally for several months. Three lawyers working for Clinton, Cheryl Mills, David Kendall, and Heather Samuelson, then sorted Clinton’s emails into those they deemed work-related or personal. According to a later FBI report, “on or around December 2014 or January 2015, Mills and Samuelson requested that [Platte River Networks (PRN) employee Paul Combetta] remove from their laptops all of the emails from the July and September 2014 exports. [Combetta] used a program called BleachBit to delete the email-related files so they could not be recovered.” PRN is the computer company managing Clinton’s emails at the time. Combetta then remotely connects to the laptops of Mills and Samuelson using the computer program ScreenConnect to complete the deletions. Clinton’s emails are being stored in a .pst file. Combetta will later tell the FBI “that an unknown Clinton staff member told him s/he did not want the .pst file after the export and wanted it removed from the [Clinton server]” as well. Between December 5, 2014 and December 11, 2014: Clinton tells Mills she doesn’t need her “personal” emails, resulting in Mills telling those managing Clinton’s server to delete them. In 2016, Clinton’s former chief of staff Cheryl Mills will be interviewed by the FBI. Mills will claim that in December 2014, Clinton decided she no longer needed access to any of her emails older than 60 days. This comes shortly after the State Department formally asked Clinton for all of her work-related emails, on October 28, 2014. This decision has to take place before an email discussing it on December 11, 2014, written Paul Combetta, the Platte River Networks (PRN) employee managing Clinton’s private server. Even so, Mills will claim she instructed Combetta to modify the email retention policy on Clinton’s clintonemail.com email account to reflect this change. (PRN is managing Clinton’s private server at the time.) This means that the 31,830 Clinton emails that Mills and Clinton’s other lawyers David Kendall and Heather Samuelson recently decided were not work-related will be deleted after 60 days. However, Combetta will later say in an FBI interview that he forgot to make the changes to Clinton’s clintonemail.com account and didn’t make them until late March 2015. December 11, 2014: The person who will later delete Clinton’s emails refers to a “Hillary cover-up operation,” which might or might not be a joke. Nothing more has been publicly released about this. However, it has been reported that Clinton decided in December 2014 to change the email retention policy on her private server to 60 days, effectively permanently wiping all her emails from her tenure as secretary of state. Combetta is the one given this job, but he will not do it until late March 2015, under mysterious and controversial circumstances. Note that the FBI summary will merely report Combetta’s claim that “Hillary cover-up operation” comment was a joke and doesn’t give an opinion if that is true or not. Shortly After March 2, 2015: Cheryl Mills has a computer company check on the condition of Clinton’s private server after the media makes Clinton’s use of the server front-page news. On March 2, 2015, the New York Times publishes a front-page story about Clinton’s emails practices and her use of a private email server. In the days following the publication of the article, Cheryl Mills, who is one of Clinton’s lawyers as well as her former chief of staff, requests that Platte River Networks (PRN), the computer company managing Clinton’s server, conduct a complete inventory of all equipment related to the server. In response to this request, an unnamed PRN employee travels to the Equinix data center in Secaucus, New Jersey, where the server is located, to conduct an onsite review of the equipment. At the same time, another unnamed PRN employee logs in to the server remotely to check on it. March 3, 2015 or Shortly Thereafter: The employee who will later delete all of Clinton’s emails is asked about what Clinton emails might be turned over. 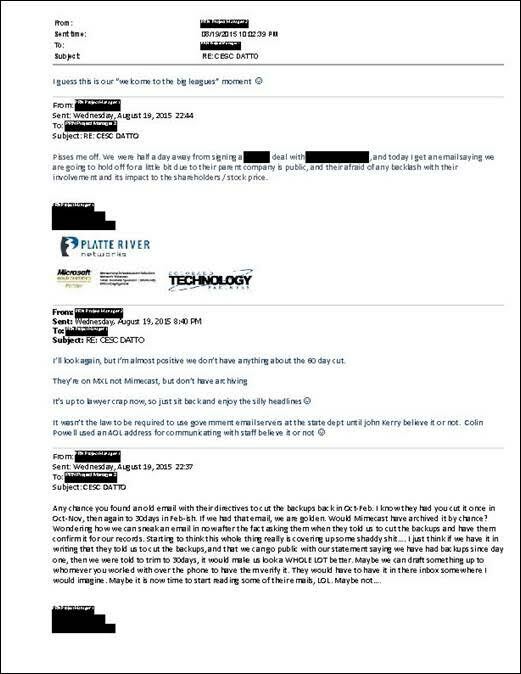 On March 3, 2015, David DeCamillis, the vice president of sales for Platte River Networks (PRN), wonders what emails the company might be asked to turn over in an email to other PRN employees. This is because of a New York Times article on March 2, 2015 revealing Clinton’s exclusive use of a private email address hosted on her private server, and PRN has been managing that server since June 2013. It is not clear if this is all of Combetta’s reply. But if it is, it is notable that he doesn’t mention that he deleted and then wiped all of Clinton’s emails off the laptops of two lawyers working for Clinton by this time, and allegedly was told to change the settings on Clinton’s server so her emails would be deleted over time as well. March 8, 2015: Someone deletes email accounts other than Clinton’s from Clinton’s private server. A .pst or “Personal Storage Table” file is a file format used to store copies of emails and other items within Microsoft software. This incident will only be mentioned in a footnote in an FBI report, with no mention of who made the deletions or why. It also is not clear how thorough the deletions are. Clinton’s deputy chief of staff Huma Abedin had a frequently used email account hosted on the server, but it is unknown if these deletions include her emails. It seems probable an employee of Platte River Networks (PRN), the computer company managing Clinton’s server, made the deletions. Shortly after a news report made Clinton’s use of the server public knowledge on March 2, 2015, Cheryl Mills, who is one of Clinton’s lawyers as well as her former chief of staff, requested that PRN conduct a complete inventory of all equipment related to the server, and one unnamed PRN employee physically checked the server while another one remotely logged on to check it. March 25, 2015: A conference call precedes the permanent deletion of Clinton’s “personal” emails. Platte River Networks (PRN), the computer company managing Clinton’s server, holds a conference call with some members of former President Bill Clinton’s staff. This is according to a later FBI report, but the FBI has not revealed who exactly takes part in the conference call or what is discussed. PRN employee Paul Combetta will later say that in the days just after this call, between March 25 and 31, 2015, he suddenly remembers that he did not make changes to the email retention policy to Clinton’s email account, as one of Clinton’s lawyers (and her former chief of staff) Cheryl Mills requested him to do back in December 2014. He will then proceed to do so, resulting in the permanent deletion of all of Clinton’s emails that had been deemed personal. March 31, 2015: A Platte River Networks employee talks to two of Clinton’s lawyers shortly after deleting and wiping all of Clinton’s emails from her server. Platte River Networks (PRN) is a computer company managing Clinton’s private server. PRN employee Paul Combetta will later admit to the FBI that he deleted all of Clinton’s emails from her server and then used the computer program BleachBit to permanently eliminate the emails. This is despite the fact that he claims he had only been told by one of Clinton’s lawyers (and her former chief of staff) Cheryl Mills back in December 2014 to change the email retention policy on Clinton’s account. On March 25, 2015, there was a conference call between PRN employees and members of former President Bill Clinton’s personal staff. On March 31, 2015, there is another conference call. Combetta will later say he made the deletions at some point between the two calls. October 23, 2015: A computer company tells the FBI that its back-up copy of Clinton’s private server data was deleted in late March 2015. Steven Cash is a lawyer for Datto, Inc., the company that has been backing up the data on Clinton’s private server. They have been subcontracted to do this by Platte River Networks (PRN), the company managing the server. Cash emails an unnamed FBI agent, informing him of several issues to be aware of prior to a conference call planned for later that day. A Datto hard drive, the Datto SIRIS S2000, has been attached to Clinton’s server since June 2013. Cash says that Datto technical experts have reviewed administrative files and discovered through the device’s Internet interface that a series of deletions took place on the device on March 31, 2015, between 11:27 a.m. and 12:41 a.m. The data had a date range from January 28, 2015 to March 24, 2015. In a May 2016 FBI interview, PRN employee Paul Combetta will confess to deleting all of Clinton’s emails on her server as well as the Datto back-up device in precisely this time period, between March 25, 2015 and March 31, 2015. It is not known if the FBI knew of the deletions prior to this letter from Datto. However, the letter certainly makes it clear, but this will not become public knowledge until an FBI report released in September 2016, almost one year later. April 9, 2016: Cheryl Mills tells the FBI she never knew Clinton’s emails got deleted. In late March 2015, Paul Combetta, an employee of Platte River Networks (PRN), deleted all of Clinton’s emails from her private server and then used a computer program to permanently wipe them. Cheryl Mills, one of Clinton’s lawyers and her former chief of staff, had communications with Combetta in that time period, including speaking in a conference call in which he also participated just after the deletions were done, on March 31, 2015. June 21, 2016: The FBI recovers 302 previously lost Clinton emails from a Gmail account; two of them were deemed classified when they were sent. In February 2014, an unnamed Platte River Networks (PRN) employee created a Gmail email account and briefly transferred all of Clinton’s emails into it from a back-up of Clinton’s server made in the spring of 2013. He transferred the Clinton emails to a new version of this server, but most of the emails on this server will later be destroyed. He also will tell the FBI that he deleted all of the emails from his Gmail account after completing the transfer. However, the FBI will later report that on June 21, 2016, FBI investigators discovered 940 Clinton emails that were still on the Gmail account somehow. It has not been explained if the PRN employee simply failed to delete them all or if deleted emails were recovered. July 2, 2016: Clinton tells the FBI she never knew her emails got deleted. In late March 2015, Paul Combetta, an employee of Platte River Networks (PRN), deleted all of Clinton’s emails from her private server and then used a computer program to permanently wipe them. Two of Clinton’s lawyers, Cheryl Mills and David Kendall, had communications with Combetta in that time period, including speaking in a conference call in which he also participated just after the deletions were done, on March 31, 2015. July 5, 2016: FBI Director Comey announces he will not recommend Clinton’s indictment on any charge, but he calls her “extremely careless” in handling highly classified information. FBI Director James Comey gives a public speech in front of a group of reporters. The timing is surprising, since this brings an end to the FBI’s investigation of Clinton’s email practices, and just a Sunday and the Fourth of July holiday separate this from the FBI’s interview of Clinton on July 2, 2016. Comey spends most of his speech criticizing Clinton, but ends it by saying he will not recommend that the Justice Department pursue any indictment of Clinton or her aides. Comey’s fifteen-minute speech includes the following information, in order, with key phrases bolded to assist in understanding. The FBI analyzed the over 30,000 work emails that Clinton did turn over to the State Department in December 2014, working with other US government departments to determine which emails contained truly classified information at the time they were sent, and which ones were justifiably classified later. It had previously been reported that the FBI had recovered most or all of the 31,830 emails that Clinton had deleted, allegedly because they contained personal information only. However, Comey reveals that was not the case, and thousands of emails were not recovered. He gives an example of how when one of Clinton’s servers was decommissioned in 2013, the email was removed and broken up into millions of fragments. The FBI “discovered several thousand work-related emails” that were not included in the 30,068 emails Clinton returned to the State Department, even though Clinton claimed under oath that she had returned all her work-related emails. The FBI found these after they “had been deleted over the years and we found traces of them on devices that supported or were connected to the private email domain.” Others were found in the archived government email accounts of other government employees whom Clinton frequently communicated with. Still others were found “from the laborious review of the millions of email fragments” of the server decommissioned in 2013. Out of these additional work emails, three were classified at the time they were sent or received – none at the ‘top secret’ level, one at the ‘secret’ level, and two at the ‘confidential’ level. None were found to have been deemed classified later. However, he also admits that “It could also be that some of the additional work-related emails we recovered were among those deleted as ‘personal’ by Secretary Clinton’s lawyers when they reviewed and sorted her emails for production in 2014.” He claims that the three lawyers who sorted the emails for Clinton in late 2014 (David Kendall, Cheryl Mills, and Heather Samuelson) “did not individually read the content of all of her emails…” Instead, they used keyword searches to determine which emails were work related, and it is “highly likely their search terms missed some work-related emails” that were later found by the FBI elsewhere. He adds that it was a similar situation with emails classified at the “secret” level when they were sent, although he doesn’t specify how many. He then criticizes the State Department as a whole. The FBI found evidence that “the security culture” of the State Department “was generally lacking in the kind of care for classified information found elsewhere in the government.” This was especially true regarding the use of unclassified email systems. He concludes by saying the FBI’s investigation was done competently, honestly, and independently, and without any kind of outside influence. July 7, 2016: FBI Director Comey says it is unclear if any of Clinton’s emails were deleted by Clinton or anyone else. However, in September 2016, the FBI Clinton investigation’s final report will be released, based entirely on information learned by the FBI prior to Comey’s testimony. That makes clear that in late March 2015, someone used a computer program called BleachBit to delete all of Clinton’s emails off her server and then wipe them to prevent their later recovery. It is unknown why Comey fails to mention this. August 25, 2016: It is alleged that Clinton’s lawyers used a computer program to make sure her deleted emails couldn’t be recovered. Since late 2014, when Clinton and her lawyers deleted over 31,000 of Clinton’s emails from when she was secretary of state, it has been unclear if the emails were simply deleted or “wiped,” meaning deliberate steps were taken to make sure they couldn’t be recovered later. September 6, 2016: Representative Chaffetz asks a federal prosecutor to determine if Clinton and/or members of her staff played a role in deleting her emails from her private server. September 8, 2016: The FBI gave an immunity deal to the computer employee who deleted and wiped Clinton’s emails. However, many questions remain, including why Combetta got immunity and when. He was interviewed by the FBI twice, and his answers in his second interview sometimes directly contradict his answers in his first interview, meaning he had to have lied to the FBI at least once, which is a felony. In his second interview also admitted to deleting Clinton’s emails despite being aware of a Congressional order to preserve her emails, which would suggest an admission of additional crimes. September 12, 2016: Senator Grassley accuses the FBI of manipulating which information about the Clinton email investigation becomes public in order to hide certain events. Senator Charles Grassley (R), chair of the Senate Judiciary Committee, speaks in the Senate about difficulties he is having with the FBI’s selective release of information regarding the FBI’s Clinton email investigation. September 28, 2016: FBI Director James Comey denies Paul Combetta attempted to cover up Clinton’s emails. In a House Judiciary Committee hearing, Comey comments on a July 2014 Reddit post by Paul Combetta, a Platte River Networks employee who helped manage Clinton’s private server. Comey says, “Our team concluded that what he was trying to do was when they produced emails not have the actual address but have some name or placeholder instead of the actual dot-com address in the ‘From:’ line.” As a result, the FBI believes Combetta was not engaged in a secret cover-up when he used his “stonetear” alias on the Reddit website to ask for a tool that could delete Clinton’s email address throughout a large file.